The book begins with a broad overview of the current education scene—from primary to tertiary education. The need to cultivate a culture of research in the higher education institutions (HEIs) that is contextually important and relevant is also emphasized. 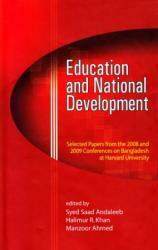 Two specific aspects of women’s (and, girls’) education in Bangladesh suggest the importance of educating women. The high dropout rates from secondary schools, especially for girls, is also examined, concluding that in addition to financial and cultural reasons, a key factor causing dropout is the lack of curricular relevance to the lives and activities of girls. The need to modernize science education and make it more meaningful as a subject; the role of madrassah education that has grown phenomenally; and how gender stereotypes about choosing college education and hence career options ought to be addressed to bring about greater equity for women in the labor market are also addressed. The final chapter of the book summarizes the panel discussion that took place in the education plenary in October 2009 and suggests various strategies that the education sector ought to adopt to meet the needs of a 21st century workforce.